Cabbage is ideal for weight loss.It has less calories and high in fiber. Including cabbage in your diet help to reduce weight. 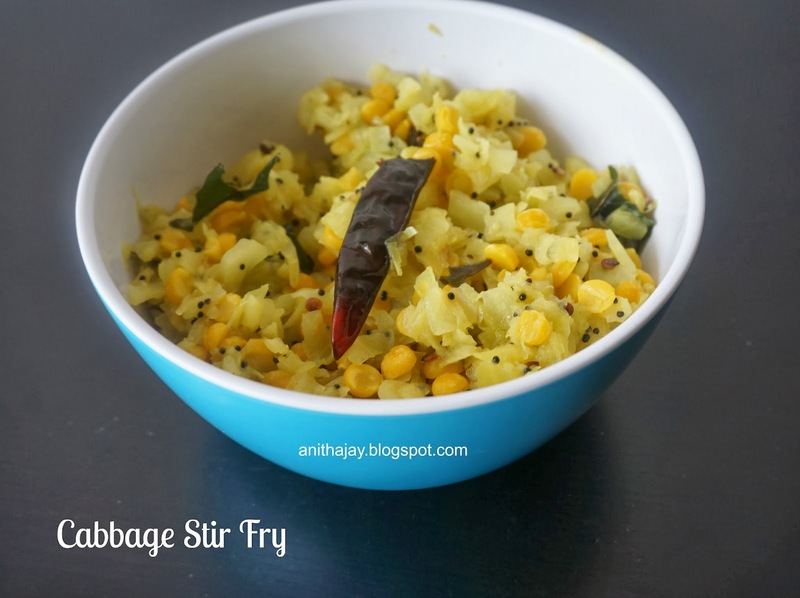 This Cabbage stir fry is simple and easy to make.When you lazy to cook ,you can make this healthy stir fry with in less time. Soak channa dal for half hour in hot water. In a vessel take cabbage, soaked channa dal , Turmeric powder and some salt. Add 1 1/2cup of water and cook till cabbage cooked.Drain any left over water and keep aside. Heat oil in a pan , add mustard seeds once splutter add curry leaves and red chilli. Now add cooked cabbage and channa dal. Mix well and cook for 2 -3 minutes. Switch off the flame. Serve with Rice or Chappathi.